A lot has happened since the last update, but this post will focus on the geese. We’ve had a bit of a switch around with names, aiming to have animals named according to their year of birth. All of our animals so far were born in 2015 so they will have A names. Jules and May have been renamed Athos (Musketeers) and Abigail (Hannibal). April (TMNT) has kept her name. 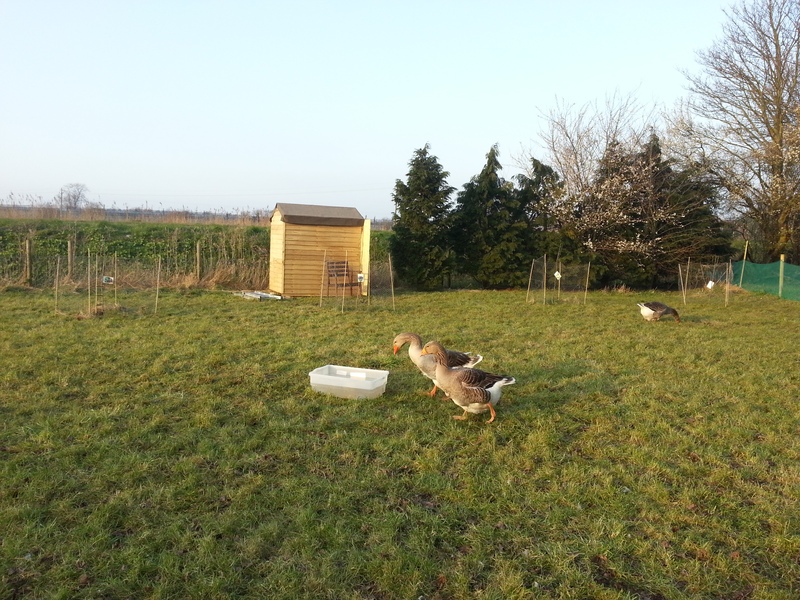 After a few escape attempts we fenced off a new area for the geese. They now have 0.2 acres to roam. I was worried that they would switch and start laying in the new area but luckily they seem to have imprinted on the ‘orchard’. 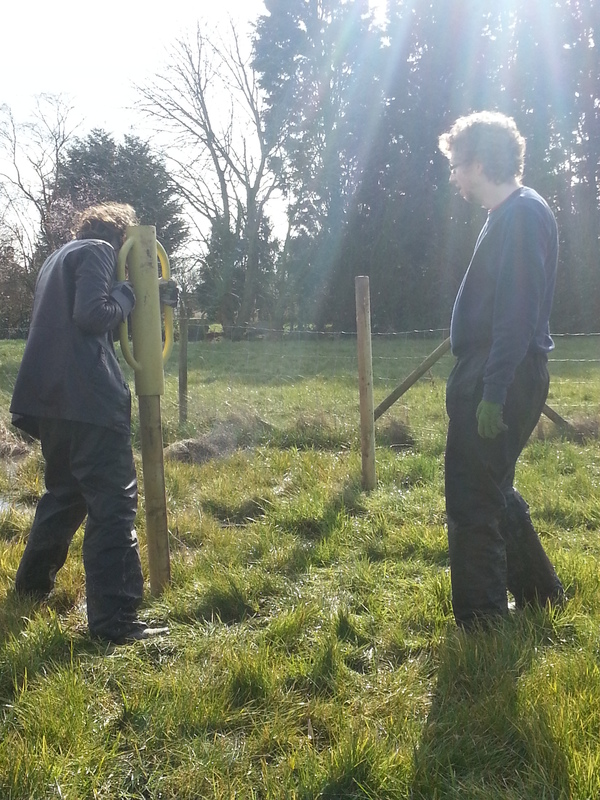 We are now thinking about digging a pond for them in the boggiest area. We’re hoping that will improve drainage all round. 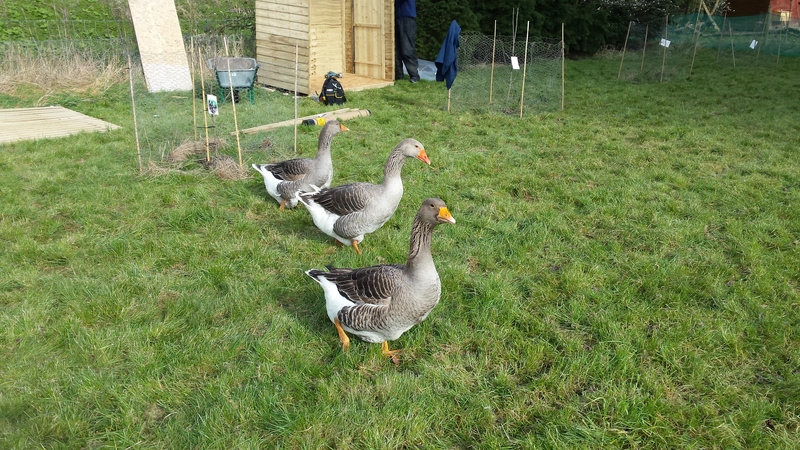 The geese have had even more fencing as we gave up on the windbreak fabric we put up in the last post. Abigail went under it too many times, it was starting to break free from the staples holding it up and then Athos went over the top to attack our helper Lis. 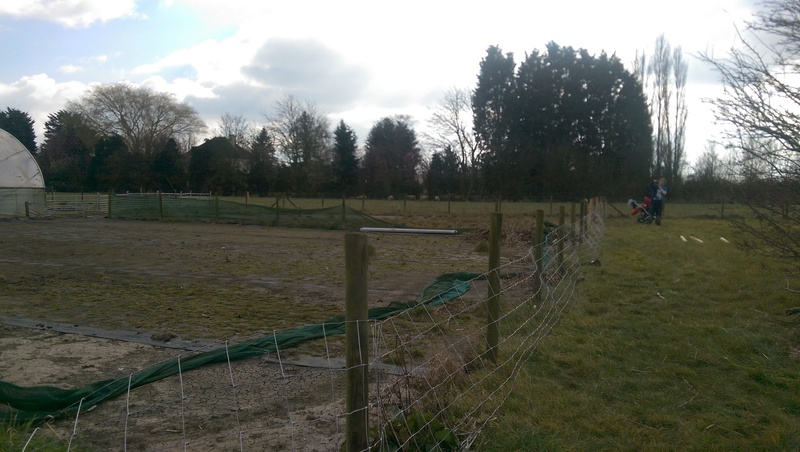 So 1M stock fencing went up, just need to get a gate in there which will make getting to them a lot easier. We had a couple run ins with Athos getting a bit more protective but he seems to have calmed a bit since we started walking with a stick and using a dustbin lid to aid in egg collection. 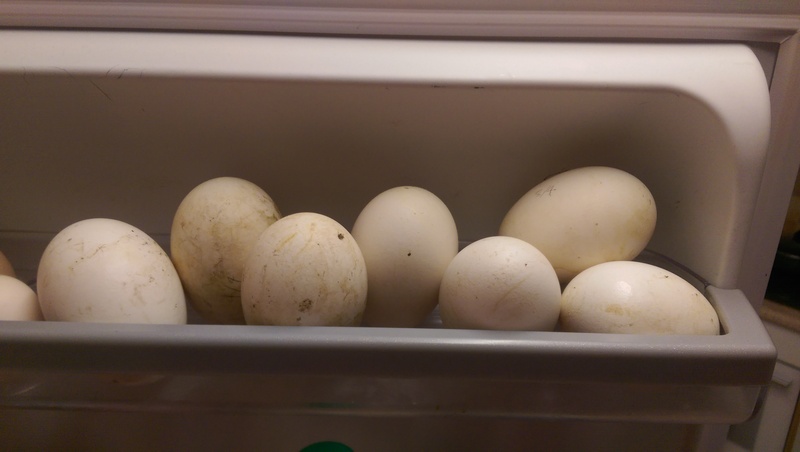 The girls are laying really well. We’re now on 35 eggs from April and 36 from Abigail. The highest egg estimate I saw was 40 so I am hoping that they exceed that as I was expecting them to lay until at least the end of May. Omelette had been our go to goose egg meal but after tasting a fried goose egg I am sold. Still need to have a go at a soft boiled one though! I’m reconsidering the hatching goslings idea. It’s quite likely that Athos, Abigail and April are all related and we’ve no idea if their parents were related or not. However I am still interested in having some goslings. Athos and Abigail are very much bonded which leaves April all on her own a lot of the time. If we got a couple of goslings we could kill one in the winter and keep one as another layer/companion for April. Another girl would also be useful as April is now sporting a bald patch from some rather eager affections from Athos. If we could get the geese to actually lay in the shed we’d be able to sell the eggs. Currently they get quite muddy. Unfortunately they seem to be very fixed in the idea of sharing a nest in a spot that gets wet when we get a lot of rain. If anyone has any tips to get them into the shed that would be awesome. The last bit of news on the goose front is a mouse problem. They have started getting in to the layers pellets bucket and have been trying to get into the water/corn bucket and drowning. We’ve started taking the pellets away at night but there’s still some droppings so time to find another feeding system I guess. Don’t know if this would help but how about putting down lots of straw or wood chippings over the boggy bits? Unfortunately it’s a very large area and the standing water gets quite deep (you wouldn’t want to go without wellies!) after we’ve had a lot of rain. We’re still thinking about the pond idea, might get some drainage experts in for some advice.